The Hutt city council in partnership with Age Concern (an NGO) started a programme for seniors who were all clients of Age Concern accredited visitor service. They are people who are identified as socially isolated and lonely. Once a month a group of seniors are picked up from home by a volunteer driver in a community minibus provided by the council and taken to one of the libraries in the city. 5 libraries currently participate with the last 3 about to participate very soon. 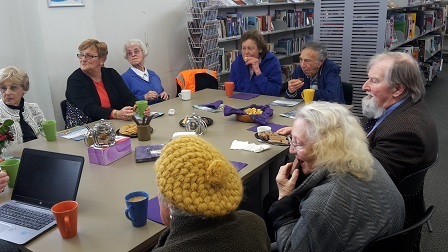 The sessions are coordinated by the Age concern visitor service coordinator and delivered by a staff member at the library who will have organised a guest speaker or activity which has been identified by the older people themselves. they have a designated quiet space for the group for about 2 hours and they will be able to share tea, coffee and biscuits in addition to their activity. we know that it has had a significant impact on our senior population as 11 months ago we piloted this in 1 library and there was a demand for this in other areas from the public once they heard about it has enabled the service to grow to 4 other libraries with the last 3 libraries coming on board in the next few months. We do know that access vis transport is an issue for many of our seniors so the free van from the council is a life saver so there is an ongoing push from the community to ensure this van remains available for the community use. Details on older people's involvement: They are asked what activities/guests speakers they want to do or see. we know that many of them are meals on wheels recipients so getting them home in time for lunch is key also. That it was increasing people's social connectedness with peers and forming new relationships and sharing stories.